THM is an open and transparent platform connecting healthcare service providers with carriers, third-party administrators and employers responsible for helping injured workers get the care they need as quickly and cost-effectively as possible. Bringing proven marketplace technology that positively transformed travel, finance and other industries, THM brings much-needed efficiency and transparency to workers’ compensation healthcare. Automating costly manual processes and eliminating expensive middlemen drives unprecedented cost savings to THM’s carrier, TPA and employer clients. 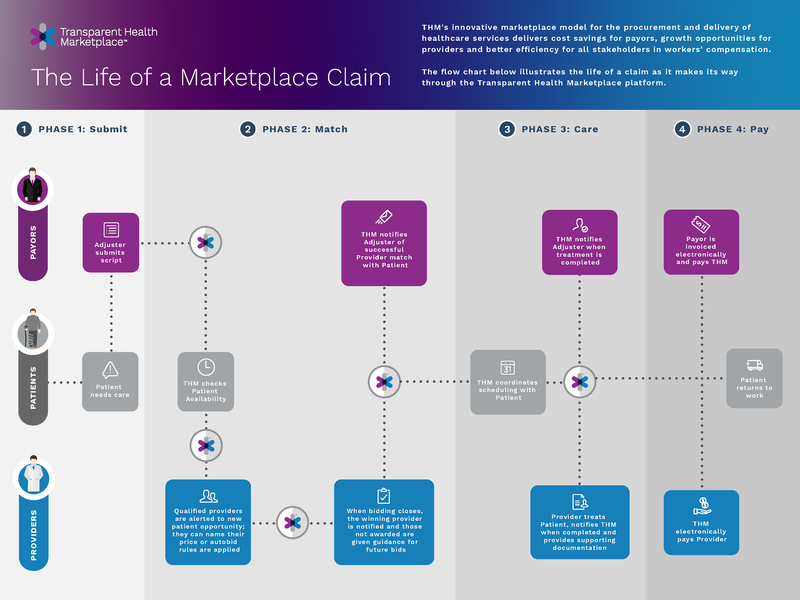 THM operates as a platform-as-a-service business model, giving payors the tools to create their own dynamic marketplace of quality providers ready to compete for their business. For providers, the THM platform creates a new channel to access referrals from some of the industry’s largest payors and the ability to control price, optimize resources and maximize revenue by filling more available appointments and moving excess inventory through its easy-to-use interface. The only healthcare marketplace of its kind, THM is committed to being an impartial, technology-driven platform to facilitate direct connections between payors and quality-assured providers while bringing rational, market-driven pricing to healthcare. Direct connections and market-driven pricing for workers’ compensation. Automated buying and selling of services in an open, spot marketplace have transformed dozens of industries and healthcare is ripe for the kind of positive, profitable disruption THM creates for its payor and provider partners. Our investment in technology and a long-term commitment to reinventing healthcare translates into powerful data intelligence and other security features built for the protection of our payor and provider partners. Creating an open marketplace driven by cost transparency makes THM an impartial player committed to delivering a safe, secure platform where all of its stakeholders can count on consistency, fairness and amazing customer support. Our easy-to-use interface is built around a dedication to simplicity and eliminating unnecessary steps, paperwork and administrative burdens that have historically been pain points for both payors and providers.